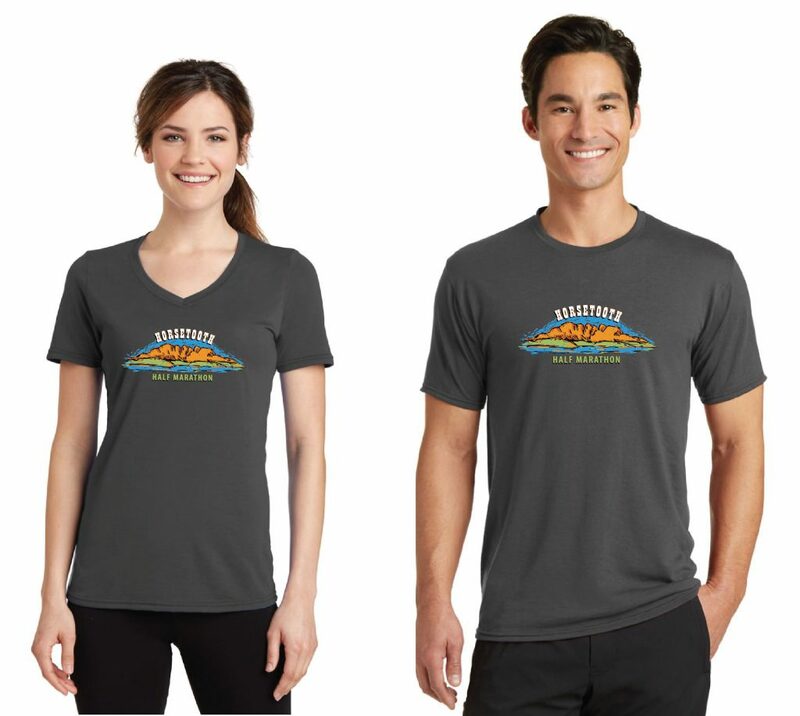 We’re really excited to reveal the design for this year’s official Horsetooth Half Marathon race shirts. Local Laporte artist Mary Boyts offers a beautiful watercolor rendition of the iconic Horsetooth Rock as seen from the eastern shores of the reservoir in the opening miles of the course. 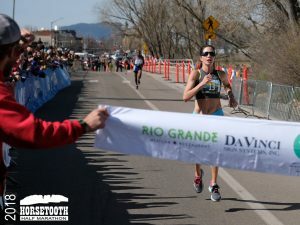 All registered participants will receive the technical Green Layer shirts with their packets, available the day before the race on Saturday April 13 at the pre-race expo at Raintree Athletic Club. Shirts and bibs will also be available for pickup on race morning. 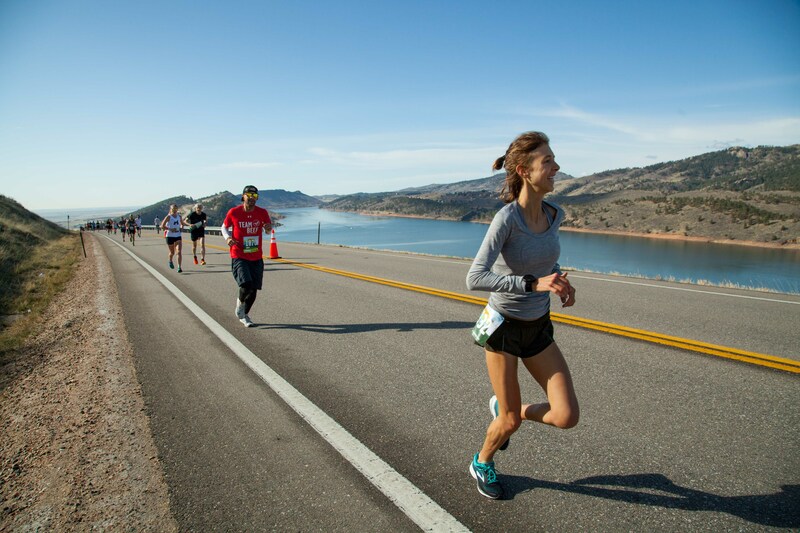 Thank you for choosing to participate in the 45th running of the Horsetooth Half Marathon. 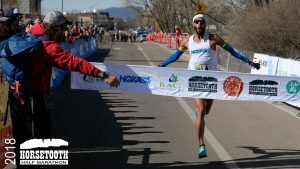 This year we’ll be welcoming record numbers of runners to undertake the journey from Hughes Stadium to New Belgium Brewing, and we’re excited that you’ll be a part of that journey. While all relevant race information is available on the race website, we’d like to draw your attention to a few important race details and to also highlight a few of our partners who are helping to make this year’s event the best yet. We’re especially thankful to our top-tier sponsors who have all become integral parts of the race planning and execution process. Pre-race packet pickup will be at Raintree Athletic Club on Saturday April 14 from noon until 6:00pm. Raintree is located on the NW corner of Drake and Shields at 2555 S. Shields St. In order to avoid lines on race morning, we encourage you to pick up your packets on Saturday. 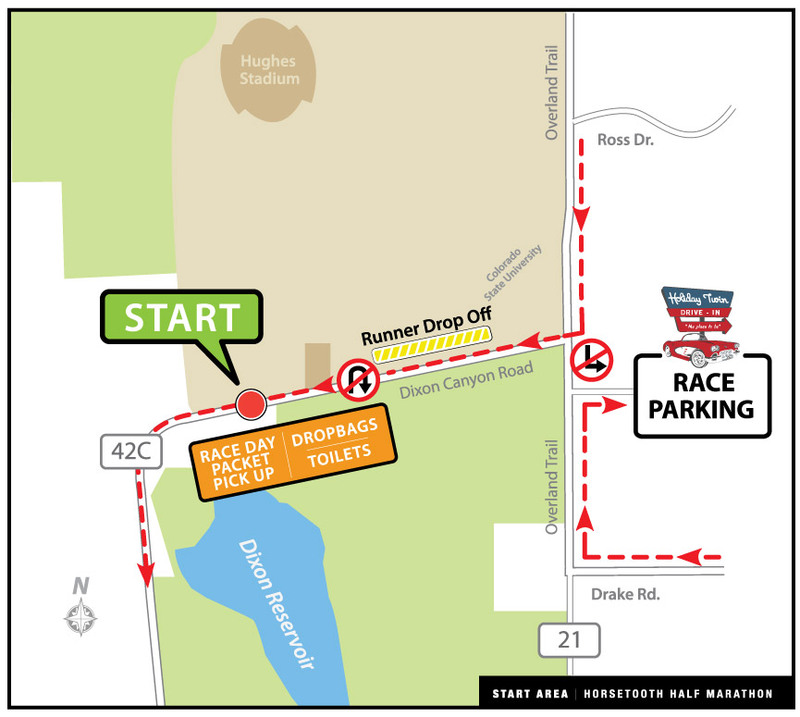 If you are not able to make it to Saturday’s packet pickup, then we will also be offering race morning packet pickup from 7:00am – 8:15am at our new staging location on the private lot directly to the south of the race start. 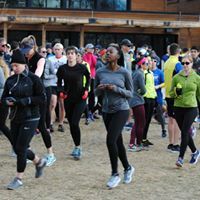 *** Per our race registration policy, we cannot offer transfers, refunds or deferrals to 2019. 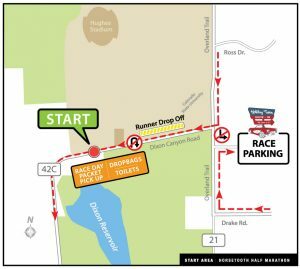 The race will begin at 8:30am on County Road 42C (Dixon Canyon Rd) adjacent to the southwest gate of Hughes Stadium, directly under Dixon Canyon Dam. Parking will be at the Holiday Twin Drive In. 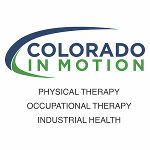 All Drive-In parking wll be from the south, off Overland Trail Rd (right turn only). We expect parking to be tight, so please carpool with friends or get dropped off if you can. 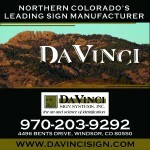 Additional parking is avaiable on city streets directly to the north of the Drive-In. Runner drop-off will be on the hard shoulder of the westboud lane of CR 42C. Drop-off will be ‘airport style’ so please be ready to ‘de-car’ once you arrive. All drop-off access onto CR 42C will be from the north off Overland Trail (right turn only). 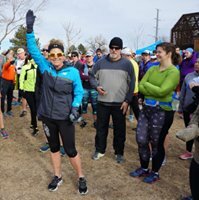 There will be no U-turns on CR 42C once runners are dropped off. Drop off vehicles will exit to the west and can circle back into town south on 38e or north on Centennial. The Drive-In is located 3/4 of a mile east of the race start. 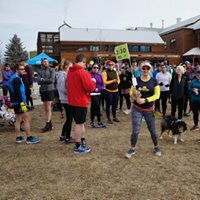 Race morning registration, port-a-johns and packet pickup will all be on the private lot directly to the south of the race start. Please plan accordingly in terms of the time you’ll need to get from your car to the start. We advise getting to the Drive-In no later than 7:30. 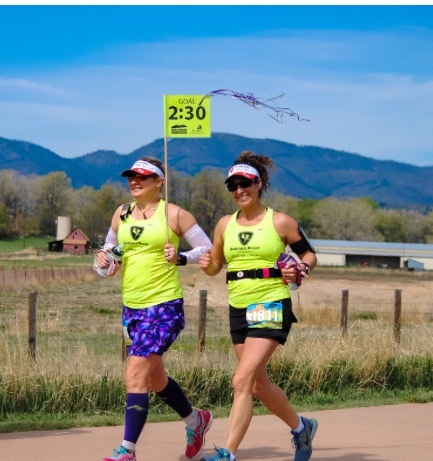 If you need clothing or other gear transported to the finish, a bag drop will be available on race morning at the packet pickup and registration location. A tag from your race bib must be pinned to your bag prior to dropping off (we will not be providing bags). You will need to show your race bib to collect your bag at the finish. While we will make every effort possible to ensure all bags are reunited with their owners, we strongly recommend that you not pack valuables in your gear bag. 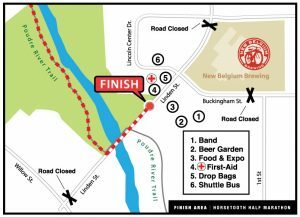 Free busing will be available from the finish at New Belgium back to the Drive-In parking. Buses will be running from 10:00am to 2:00pm. 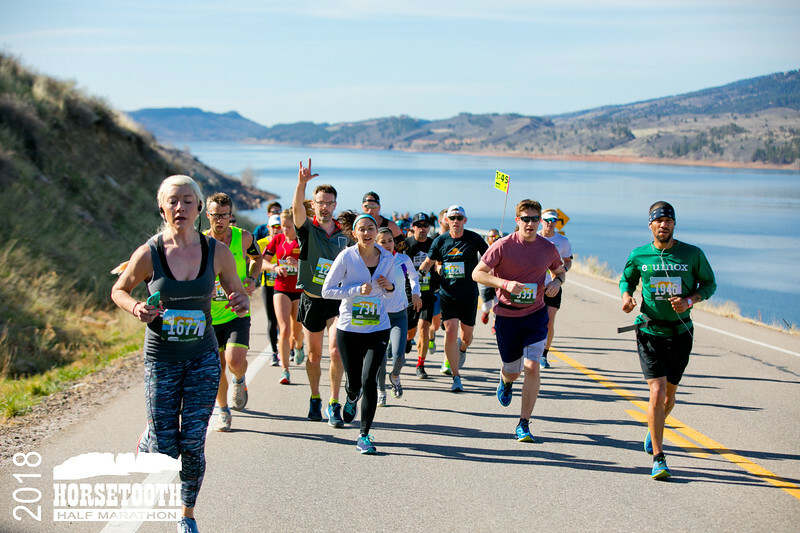 The famed Horsetooth Half Marathon post race party will take place on the grounds immediately to the south of New Belgium Brewing. 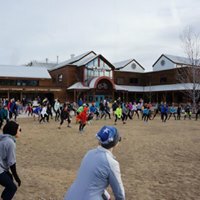 All race participants are welcome to enjoy free beer from New Belgium, in addition to post-race burritos from The Rio Grande Mexican Restaurant with cinnamon rolls from the Great Harvest Bread Company and cookies from Mary’s Mountain Cookies (Old Town). Non-alcoholic beverages will be available from Eldorado Spring Water. Beers will be served only to those runners who have shown proof of age and are wearing an over-21 wristband. 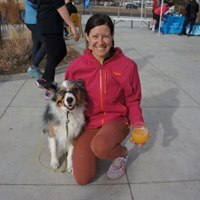 This can be taken care of at packet pickup on Saturday (wristband must be attached then) or at the entrance to the beer garden after the race. 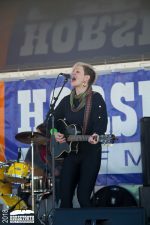 With your race run, and food and beverages in hand, please sit back in the beer garden or picnic area and enjoy live music from The Patti Fiasco. 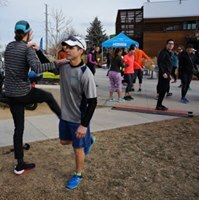 Or peruse the post-race expo booths and enjoy samples from vendors or a complimentary massage from our volunteer masseuses. 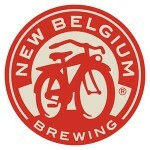 Food for family and friends will be avilable from food trucks at New Belgium. Everyone is welcome to enjoy the live music and vendor expo. 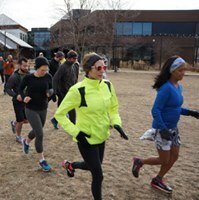 If you’re looking to hit a specific finish time, we have a team of pacers lined up to help you get there. If you have questions related to pacing, then be sure to stop by the pace group table at packet pickup on Saturday. We’ll have pace leaders for the following goal times: 1:30, 1:45, 2:00, 2:15, 2:30. Given the hilly nature of the course, mile splits will not be even. We will have suggested mile-for-mile pacing charts available at packet pickup. Or, check out sample pacing splits here. Mile 10.3 Sponsored by Orangetheory Fitness and benefiting Teaching Tree. Thank you and have a great race! Thank you to LuLuLemon for outfitting our pace team this year. 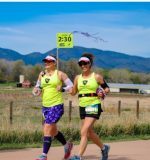 If you want to learn a little more about the runners pacing the different groups, please see the recent profiles on the race facebook page. 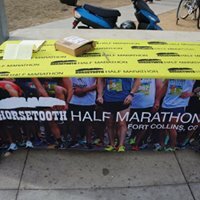 We will also have a pacer table at Saturday’s packet pickup at Raintree Athletic Club where you can chat with our pacers and pick up a custom-made Horsetooth Half split guide for the 5 different goal finish times. You can also check out the split guide at the link below. 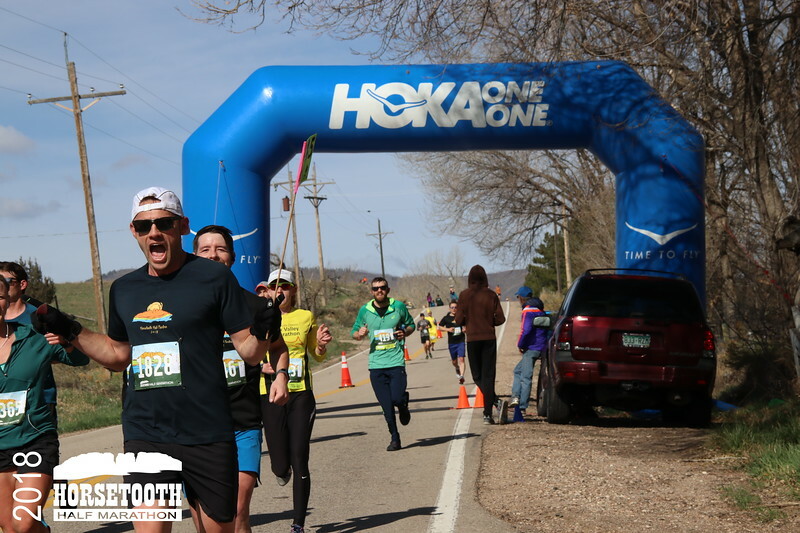 Check out our Horsetooth Half Pacing Chart.